The Yankees signed the strangest, most intriguing free agent of the offseason on Thursday. They also signed the New York-iest. ​Adam Ottavino, straight out of Brooklyn and over a decade removed from slinging hammers at the Berkeley Carroll School, is a proud No. 0 with a penchant for punch-outs. And, not for nothing, he provides the one thing the 2017 Yankees had that the 2018 edition didn't: ​hard-earned New York character. Now, I'm well aware that everyone reading this from outside the boroughs (and, hell, even in Queens) just gagged up chunks of soft pretzel. No one on earth--on EARTH--wants to hear about what being from New York means to some New Yorker. But sorry, if I have to hear it from Bostonians, you have to hear it from me. Those are the rules. Ever since Peter Stuyvesant sold Manhattan for a bundle of beads, New York idiots like me have been breathing bagel all over you, crying at, like, a "Thank You" plastic bag. And Adam Ottavino is most definitely one of my New York idiots. The energy of the 2017 Yankees was stunningly electric, thanks in part to the ​goofiness of Todd Frazier. The second half of that season ran on marketing gimmicks, and say what you will about the "Thumbs Down," but there's something about passing something on down the line, teammate after teammate, that bonds an otherwise disparate group. What do Aaron Judge, Starlin Castro, and Chase Headley have in common? Who knows, but they certainly started to all blend into one by the time October rolled around. 2018 was strange. Everything about the team was...better, but it felt worse. The roster was stronger. The trades were more shrewd. The team won 100 goddamned games. But something was lacking, and it wasn't just an inferiority complex brought on by those Boston Buffoons going 140-22. We loved 2017. We loved it so much that we collectively agreed to forget about the entire mid-June to mid-July stretch where they went, like, 4-22. That's the power of pathos. I'm not sure what Todd Frazier meant to the team, but I'm sure I loved watching him succeed. Because his motivations were the same as my own, clustered on the couch: win this for the city I love. Adam Ottavino's been imported to fill the David Robertson role as the "Geez, they have that guy too?" member of the power bullpen. Of course, Dellin Betances, his fellow force, is a native New Yorker himself. But Dellin's a casual leader. A hired hand who plops in during the eighth inning and does his business wickedly. You rarely hear from him afterwards. Ottavino, on the other hand, is as New York as humanly possible. He built a makeshift bullpen in a Harlem lot last winter like something out of Hey Arnold to get himself right after a tough 2017. He once snapped at his father, "Geez dad, everybody knows who Joe DiMaggio is!" at a Yankee game at the age of seven (per the Denver Post). His father, by the way, has co-starred in several episodes of LAW AND ORDER. This guy...this guy rules. This guy is the Stage Deli of baseball players. No, not Katz's Deli. That's a tourist trap. That's Carl Pavano. 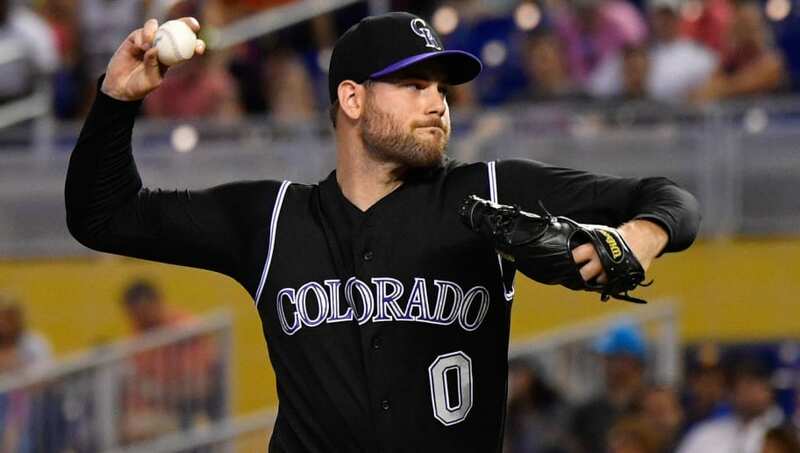 Ottavino brings plenty of value on the field, and was a necessary luxury, if that makes sense, for a team that needs its bullpen to be perfect to meet lofty expectations. But, you'll forgive me if my favorite part of the signing is his very particular brand of energy. I'm ready for another Brooklyn loudmouth like me on the mound. I could've played at Berkeley Carroll. I grew up in the neighborhood. But I...I wasn't good at all at the game of baseball. That's where Adam Ottavino and I differ. Name-wise and experience-wise? Brothers in arms. Give 'em hell, man. And welcome home.